There was presumably a time when we went to coffee shops simply to purchase caffeinated beverages. But that time is no more. A drink from a coffee shop must now have a hue bright enough to read by, plenty of pizzaz, and, above all, make a strong showing on Instagram. The newest member of this aggressively photogenic pantheon is the Mango Dragonfruit Starbucks Refresher. It is magenta. It is pretty. It even has "real red-fleshed dragon fruit (also known as pitaya) hand-shaken in the beverage with no artificial colors or sweeteners," according to a press release. Is it coffee? No. But you can, however, swap the water out for coconut milk if you order a "Dragon Drink," which will both taste and look creamier and make your picture stand out from the stream of other Dragonfruit Refreshers. 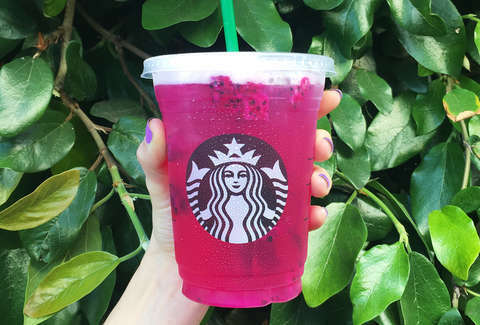 “It’s bright and vivid," said Alicia Binion from Starbucks research and development, "something you would want to take a picture of to share with friends.” Like maybe on the popular social-media platform Instagram? It's available starting Tuesday, aka today. 'Gram away.